Henry Guy to the Auditor of the Receipt to take in at the rate of 1l. 1s. 9d. each the 4,000 guineas which will be lent to-morrow on the Land Tax [the second Twelve Months' Assessment as by 3 Wm. and Mary, c. 5] by Sir Francis Child or by his procurement. My Lords will take care that they shall be issued out of the Exchequer at the same rate. Disposition Book X, p. 71. Same to the Earl of Ranelagh to report on the enclosed memorial [missing] of Theophilus Allen. Out Letters (General) XIII, p. 213. Same to the Excise Commissioners. My Lords find that of the 40,000l. which you consented to lend on the Hereditary Excise and the fourth of the Temporary Excise (for his Majesty's immediate service in this his expedition into Flanders) only 24,000l. is paid into the Exchequer. They desire you to use your utmost endeavours to complete the sum to-morrow morning, his Majesty's service earnestly requiring the same at this instant. Ibid. Same to Mr. [Charles] Fox. I have read to my Lords your report on Geo. Wood's petition. You are to insert in your [next weekly] memorial for money the 29l. 5s. 0d. which you certify as due to him. Ibid, p. 214. Same to the [Principal] Commissioners of Prizes, enclosing Samuell Robertson's proposal [missing] for paying 10,087 Ryals in Seville and Mexico pieces to the Governor of Algiers. You are to contract with him accordingly. Ibid. Same to the Customs Commissioners to pass, Customs free, certain goods for the use of Count D'Nassau's Regiment (124 Grenadier caps, 90 Bayes [pieces of baize], 200 kerseys, 120 swords, 10 bayonets). Ibid. Treasury reference to Mr. Ryley of the petition of Mr. Thomas Lee for the repair of the Lodge in Mote Park in Windsor Great Park, said Lodge being [in a] very ruinous [state]. Reference Book VI, p. 379a. Treasury reference to the Agents for Taxes of the petition of John Stanier, Receiver for co. Salop [of the second Twelve Months' Assessment], proposing a change in his security, viz. Visct. Newport, Richard Jenkins of Donnington, in the parish of Wroxeter, gent., and Francis Boycot of Uppington, co. Salop, instead of Jeremiah Powell and Edward Phillips. Reference Book VI, p. 379a. Royal sign manual for 60l. to Nicholas Nedham, esq., for half a year to June 24 next, by way of advance, on the annuity or pension granted him by the privy seal of 1690-1, Jan. 29. (Money warrant dated Mar. 7 hereon.) (Money order dated Mar. 8 hereon.) King's Warrant Book XVI, p. 175. Money Book XI, p. 274. Order Book III, p. 253. Royal warrant to the Clerk of the Signet for a privy seal to authorise the Treasury Lords to issue commissions to fit persons to be Receivers General for the respective counties, cities and places of England, Wales and Berwick, for the Poll granted by 3 Wm. and Mary, c. 6. King's Warrant Book XVI, pp. 175-6. Same to the Attorney or Solicitor General for a great seal for a grant to Letitia, wife of Robert Russell, of an annuity of 600l. for 31 years from Christmas last in consideration of a release to be first made to the Crown of the arrears of the salary allowances or disbursements of Thomas Cheke as follows. By a great seal dated 1685-6, Mar. 20, James II granted a pension of 3,000l. per an. to Katherine, Countess of Dorchester, from 1685, Christmas, for 5¼ years, together with a grant for 99 years from 1691, Lady day, of the quit rent or annual sum of 13l. 18s. 3d. issuing out of the lands of Cloghjordan and part of the lands of Garrane and other lands in the barony of Lower Ormond, co. Tipperary, granted to John Harrison by Charles II "and many other fee farm or annual rents, payments or sums of money therein particularly described" and all other the quit rents, yearly payments or sums of money therein mentioned to have been formerly granted unto James. Duke of Ormonde, deceased [see supra, Calendar of Treasury Books, Vol. VIII, pp. 548-71] : at a rent of 1,500l. per an. payable by said Countess from 1691, Lady day : and for further assurance to said Countess the said King did grant said quit rents etc. to Richard, Visct. Preston, George, Lord Dartmouth, James Grahame and Francis Gwynn for seven years in reversion of the said 99 years at the rent of 6l. per an. in trust to satisfy said Countess thereout any arrears of her said 3,000l. per an., and after such satisfaction to be as in trust for the King and to pay the proceeds thereof into the Exchequer in Ireland. Now therefore the present King, in full satisfaction of the arrears of salary, allowances or disbursements of Thomas Cheke, deceased, formerly Lieutenant of the Tower of London, grants the above 600l. per an. to Letitia, executrix and late wife of said Cheke. and now wife of said Robert Russell. The same is hereby to be payable out of the abovesaid rent of 1,500l. per an. or out of the rents so as above granted in reversion to Visct. Preston (now deceased) et al. This annuity of 600l. is hereby to be inserted on the present and all future establishments of Ireland. Further, the present herein great seal is to contain a grant to Edward Russell, esq., Fra. Russell, esq., William Hill, gent., and Zachariah Merrill of the quit rents as above for four years in reversion of the grant to the said Countess and to said Visct. Preston et al. as above and at the same rental of 6l. per an. as an assurance to and in trust for the said Letitia Russell to the extent of any unpaid arrears remaining on the said 600l. per an. and after satisfaction thereof then to hold said premises for the King and his successors and to pay the proceeds thereof into the Receipt of the Exchequer in Ireland. Ibid, pp. 177-81. Royal sign manual for 36l. to John Smith, one of the Pages of the Bedchamber, for himself and the rest of the said Pages for one year to Feb. 13 last for the charge of washing of sheets etc. for themselves and the Gentlemen and Grooms of the Bedchamber and for the carrying said sheets from place to place "as we have occasion from time to time to remove our royal person." (Money order dated March 9 hereon.) King's Warrant Book XVI, p. 182. Order Book III, p. 255. Money warrant for 4,410l. to Sir Francis Child, kt., their Majesties' Jeweller, for jewels etc. supplied as follows : viz. : a diamond ring of the value of 300l., given to the Envoy from the Duke of Savoy ; two diamond rings of the value of 250l., given to the Baron of Leyen, Envoy from the Elector of Treves ; a diamond ring of the value of 200l., given to the Count D'Autell, Envoy to [sic for from] the Elector Palatine ; a diamond ring of the value of 300l., given to Count Reventlou, Envoy from the King of Denmark ; a diamond ring of the value of 140l., given to Monsieur de Mean, Envoy from the Bishop and Prince of Liege ; a diamond ring of the value of 300l., given to Count Prela-Daria, Envoy from the Duke of Savoy ; a diamond ring of the value of 260l., given to Monsieur Haxshasinn (Haxshawsinn), who came from Savoy ; a diamond ring of the value of 200l., given to the Baron de Croseck (Crosseck), who came from the Duke of Brunswick ; a diamond ring of the value of 200l., given to Monsieur Gnerick, who came from the Duke of Holstein Gottorp ; a jewel of diamonds with her Majesty's picture, which was given to her Majesty to dispose of, of the value of 500l. 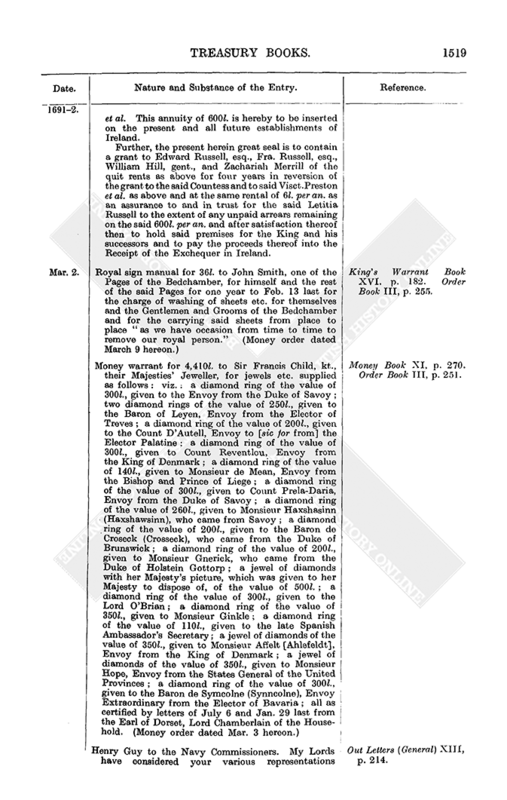 ; a diamond ring of the value of 300l., given to the Lord O'Brian ; a diamond ring of the value of 350l., given to Monsieur Ginkle ; a diamond ring of the value of 110l., given to the late Spanish Ambassador's Secretary ; a jewel of diamonds of the value of 350l., given to Monsieur Affelt [Ahlefeldt], Envoy from the King of Denmark ; a jewel of diamonds of the value of 350l., given to Monsieur Hope, Envoy from the States General of the United Provinces ; a diamond ring of the value of 300l., given to the Baron de Symcolne (Synncolne), Envoy Extraordinary from the Elector of Bavaria ; all as certified by letters of July 6 and Jan. 29 last from the Earl of Dorset, Lord Chamberlain of the Household. (Money order dated Mar. 3 hereon.) Money Book XI, p. 270. Order Book III, p. 251. Henry Guy to the Navy Commissioners. My Lords have considered your various representations touching the state of the course of payments in your Office. They direct that you proceed to the assignment of those bills which relate to the year 1691 upon orders registered on the Additional Excise and remaining in the hands of the Treasurer of the Navy applicable to that use, so far as Oct. 31 last : and that you go on with the assignment of your other bills in course, out of the money received on the Land Tax and appointed by my Lords (pursuant to the [appropriation clauses in the] Act of Parliament of [3 Wm. and Mary. c. 5]) for the wear and tear of the Navy. Out Letters (General) XIII, p. 214. Henry Guy to the Commissioners of Sewers in co. Sussex to report on the enclosed petition [missing] of Robert Colepeper concerning the decay of Rye harbour. Out Letters (General) XIII, p. 215. Treasury reference to Mr. Shaw of the petition of Eliz. Erlisman. widow of John Erlisman. late Consul at Algiers, praying payment of 628l. 2s. 0d. for her husband's extraordinary disbursements as Consul there or for such a yearly allowance as the King shall think fit. Reference Book VI, p. 379a. Treasury order, by way of subscription, for the execution of a warrant dated Feb. 27 last from the Earl of Dorset. Lord Chamberlain, to Sir Francis Lawley, Master and Treasurer of the Jewel House, for the delivery to Visct. Sidney. Lord Lieutenant of Ireland, for his Majesty's service, of two silver gilt candlesticks, a silver gilt bason, two silver gilt flagons, two silver gilt chalices with covers, two silver gilt patens : all these to be embossed : and two silver gilt maces for the Serjeants at Arms in Ireland. Warrants not Relating to Money XIII, p. 520. Royal warrant to the Lords Justices of Ireland for a patent to be passed under the great seal of Ireland for a grant to Henry Guy. Robert Rochfort and Math. Hutton, esq., of all such castles, honors, lordships, manors, messuages, lands, rents, tithes, woods, reversions. 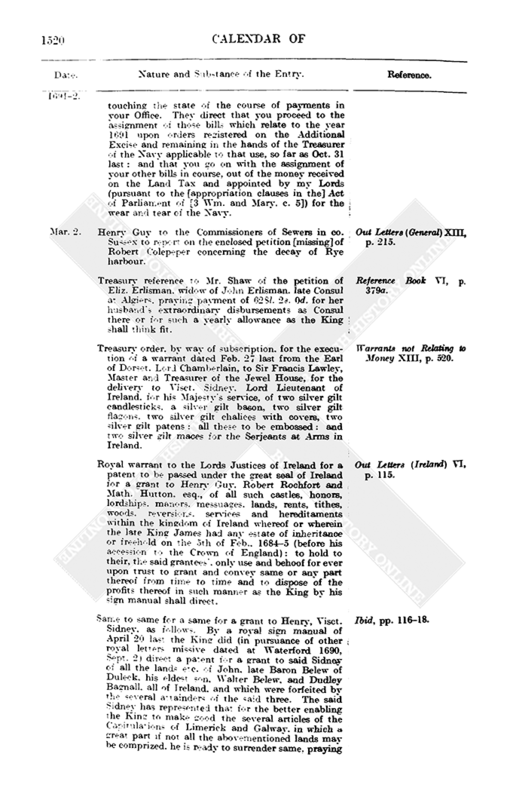 services and hereditaments within the kingdom of Ireland whereof or wherein the late King James had any estate of inheritance or freehold on the 5th of Feb., 1684-5 (before his accession to the Crown of England) : to hold to their, the said grantees', only use and behoof for ever upon trust to grant and convey same or any part thereof from time to time and to dispose of the profits thereof in such manner as the King by his sign manual shall direct. Out Letters (Ireland) VI, p. 115. Same to same for a same for a grant to Henry, Visct. Sidney, as follow. By a royal sign manual of April 20 last the King did (in pursuance of other royal letters missive dated at Waterford 1690, Sept. 2) direct a patent for a grant to said Sidney of all the lands etc. of John, late Baron Belew of Duleck. his eldest son. Walter Belew, and Dudley Bagnall, all of Ireland, and which were forfeited by the several attainders of the said three. The said Sidney has represented that for the better enabling the King to make good the several articles of the Capitulations of Limerick and Galway, in which a great part if not all the abovementioned lands may be comprized, he is ready to surrender same, praying [in lieu thereof] a like grant of all the estates real and personal of Mathias, late Baron of Trimlestown, Sir Anthony Mulledy of Robertstown, Sir Richard Neagle, kts., Mathew Barnwall (Barnwell) of Archerstown, Christopher Nugent of Dardistown, Francis Leigh of Rothbridge, Edmd. Butler of Baleraghed, Ignatius Gould of Cork city, merchant, John Grace and Robert Grace, both of Courtown, as forfeited for engagement in the late rebellion there. The King, "looking upon ourselves concerned to make good all and singular the Articles of the said Capitulations as far as in us lies," and out of a just sense of said Viscount's many, great and faithful services etc., hereby orders such a grant of the said last mentioned estates, real and personal (whereof inquisitions if not already made are hereby to be made and returned) ; upon his surrender of the prior grant as above : to be held, as to the lands, by said Sidney of the King and Queen as of the Castle of Dublin in free and common socage ; and, as to personal estate, to said Sidney's own use without account. Ibid, pp. 116-18. 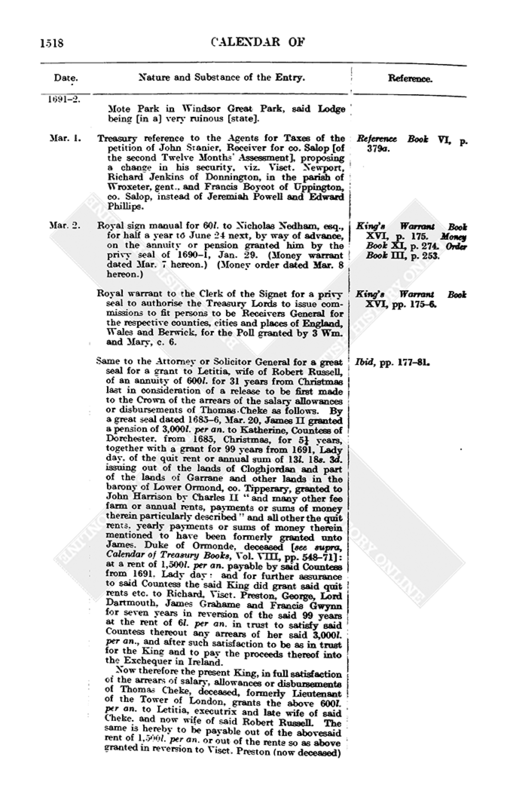 Royal warrant to Brook Bridges and Thomas Done, Auditors of Imprests, to allow to the Earl of Ranelagh in his Army account for the year commencing Jan. 1, 1691-2 [sic for 1690-1], the 15,000l. which, pursuant to Treasury direction, he paid, without deduction, to Sir Joseph Herne, being so much due from the King to the Duke of Savoy for the three months, July, August and September, 1691, upon an allowance of 5,000l. a month pursuant to a treaty in that behalf signed at the Hague 1690, Oct. 20 : which said 15,000l. was satisfied by said Ranelagh by assigning to Herne on the 4th July, 1691, ten orders (Nos. 41-50) for 1,000l. each, dated 1690-1, Jan. 24, and registered in said Ranelagh's name on the impositions on East India goods ; and 5,000l. in ready money on the 5th Sept. following : the said Herne being empowered to receive same under a procuration dated 17-27 Feb., 1690-1, from the President, D' la Tour, Envoy Extraordinary from the said Duke of Savoy. 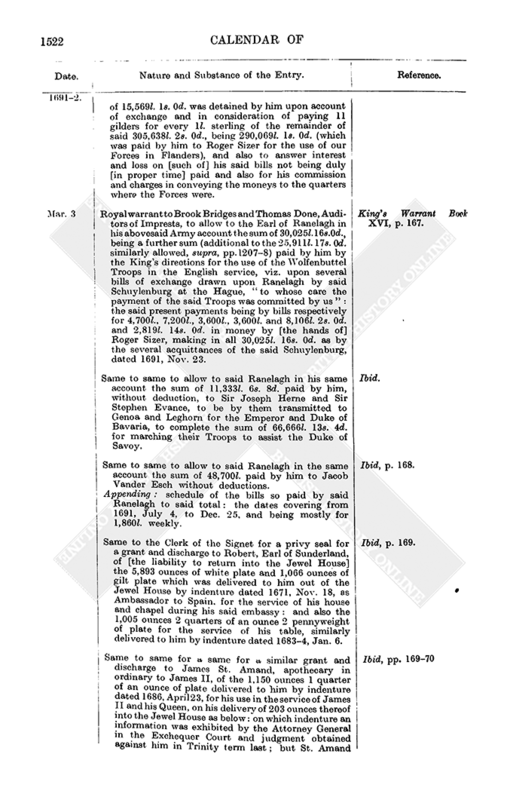 The said Ranelagh is hereby to be charged with the interim interest on the said ten orders up to the date of their assignment as above and also with the interest of the said 5,000l. cash from the dates of the tallies on which it was received up to the 5th Sept., when he paid it as above. King's Warrant Book XVI, pp. 165-6. Same to same to allow to said Ranelagh in his same account for the year commencing 1690-1, Jan. 1, the sum of 785l. 4s. 0d., being the remainder of the sum of 15,569l. 1s. 0d. which was detained by Schuylenburg on account of exchange and of which 14,783l. 17s. 0d. was directed to be allowed by the warrant of July 7 last, supra, p. 1220 : all by reason that the said William van Schuylenburg at the Hague has received from said Ranelagh the total sum of 305,638l. 2s. 0d., viz. 2,814l. in money paid him [Schuylenburg] in London, and the remaining 302,824l. 2s. 0d. upon divers bills of exchange drawn by him or by Mr. Geo. Clifford, his correspondent at Amsterdam, as appears by said Schuylenburg's general acquittance dated Nov. 21 last : and of the said sum of 305,638l. 2s. 0d. the sum of 15,569l. 1s. 0d. was detained by him upon account of exchange and in consideration of paying 11 gilders for every 1l. sterling of the remainder of said 305,638l. 2s. 0d., being 290,069l. 1s. 0d. (which was paid by him to Roger Sizer for the use of our Forces in Flanders), and also to answer interest and loss on [such of] his said bills not being duly [in proper time] paid and also for his commission and charges in conveying the moneys to the quarters where the Forces were. Ibid, p. 166. 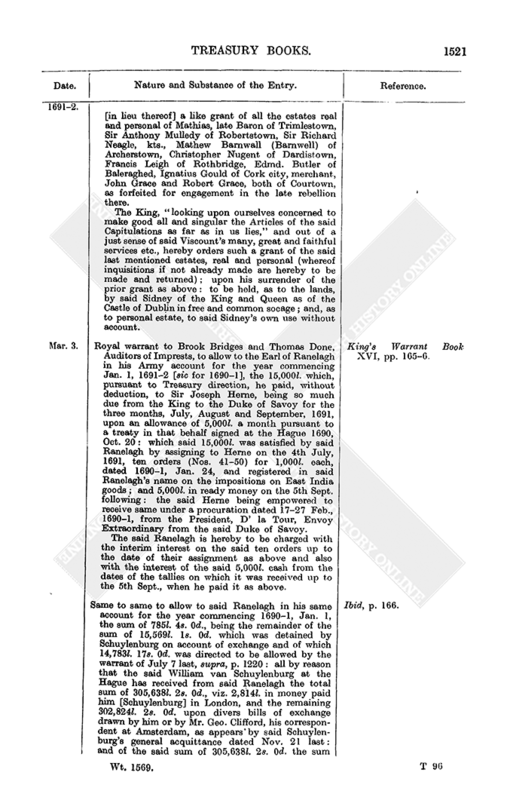 Royal warrant to Brook Bridges and Thomas Done, Auditors of Imprests, to allow to the Earl of Ranelagh in his abovesaid Army account the sum of 30,025l. 16s. 0d., being a further sum (additional to the 25,911l. 17s. 0d. similarly allowed, supra, pp. 1207-8) paid by him by the King's directions for the use of the Wolfenbuttel Troops in the English service, viz. 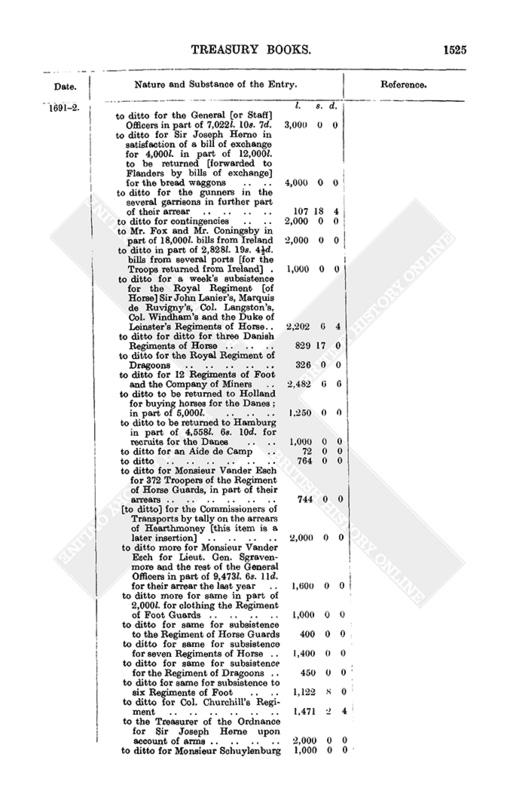 upon several bills of exchange drawn upon Ranelagh by said Schuylenburg at the Hague, "to whose care the payment of the said Troops was committed by us" : the said present payments being by bills respectively for 4,700l., 7,200l., 3,600l., 3,600l. and 8,106l. 2s. 0d. and 2,819l. 14s. 0d. in money by [the hands of] Roger Sizer, making in all 30,025l. 16s. 0d. as by the several acquittances of the said Schuylenburg, dated 1691, Nov. 23. King's Warrant Book XVI, p. 167. 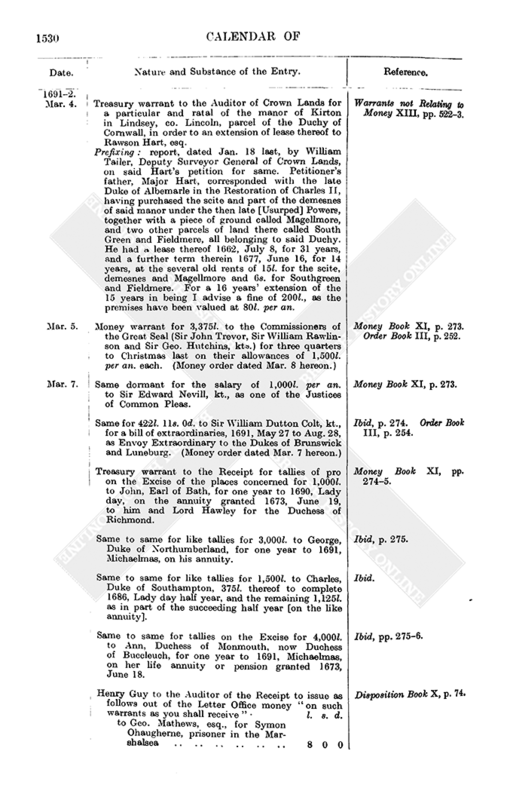 Same to same to allow to said Ranelagh in his same account the sum of 11,333l. 6s. 8d. paid by him, without deduction, to Sir Joseph Herne and Sir Stephen Evance, to be by them transmitted to Genoa and Leghorn for the Emperor and Duke of Bavaria, to complete the sum of 66,666l. 13s. 4d. for marching their Troops to assist the Duke of Savoy. Ibid. Same to same to allow to said Ranelagh in the same account the sum of 48,700l. paid by him to Jacob Vander Esch without deductions. 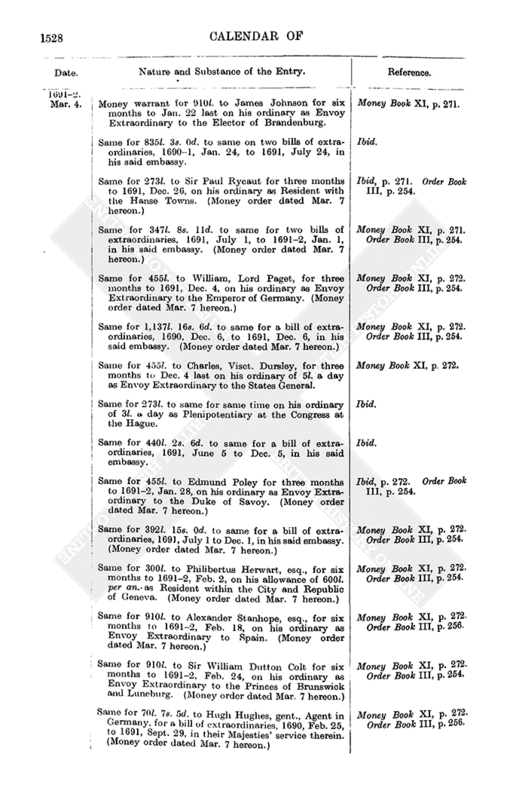 Appending : schedule of the bills so paid by said Ranelagh to said total : the dates covering from 1691, July 4, to Dec. 25, and being mostly for 1,860l. weekly. Ibid, p. 168. Same to the Clerk of the Signet for a privy seal for a grant and discharge to Robert, Earl of Sunderland, of [the liability to return into the Jewel House] the 5,893 ounces of white plate and 1,066 ounces of gilt plate which was delivered to him out of the Jewel House by indenture dated 1671, Nov. 18, as Ambassador to Spain, for the service of his house and chapel during his said embassy : and also the 1,005 ounces 2 quarters of an ounce 2 pennyweight of plate for the service of his table, similarly delivered to him by indenture dated 1683-4, Jan. 6. Ibid, p. 169. Same to same for a same for a similar grant and discharge to James St. Amand, apothecary in ordinary to James II, of the 1,150 ounces I quarter of an ounce of plate delivered to him by indenture dated 1686, April 23, for his use in the service of James II and his Queen, on his delivery of 203 ounces thereof into the Jewel House as below : on which indenture an information was exhibited by the Attorney General in the Exchequer Court and judgment obtained against him in Trinity term last ; but St. Amand having made oath June 25 last before Sir Nicho. Lechmer, a Baron of the Exchequer, that by the particular command of James II great part of the said plate, together with his chests of medicines and other travelling goods, were in November, 1688, sent to Portsmouth, since which time they have never been in the custody of the said St. Amand, but were, with other goods of the said late King and Queen, shipt for France, and that he is ready to deliver into the Jewel House one sauce pan, a pair of candlesticks, two rings for dishes, a chamber pott, a small skellett, a coffee pot and a chafing dish, amounting in all to 203 ounces. Hereon, on such delivery, all proceedings against him are to be stopped. Ibid, pp. 169-70. Royal warrant to the Attorney General for a great seal for a grant to Ralph Grey, esq., of the office of Auditor of Crown Revenues within the Principality of Wales, void by the death of Charles Herbert, esq. : to hold by himself or deputy : during pleasure : as amply etc. as the said Herbert or Sir William Godolphin or any other predecessors therein. King's Warrant Book XVI, p. 171. Same to same for a same for a lease or grant to Sir Thomas Chicheley, kt., of all those derelict lands (formerly covered by the sea and now left derelict) lying in or adjoining to the several towns and villages of South Cave, Ellerker, Broomfleet and in the hamlet of Provost, alias Provance, in co. Yorks, containing by estimation 906 acres : for 99 years from 1692, Lady day, at 50l. per an. 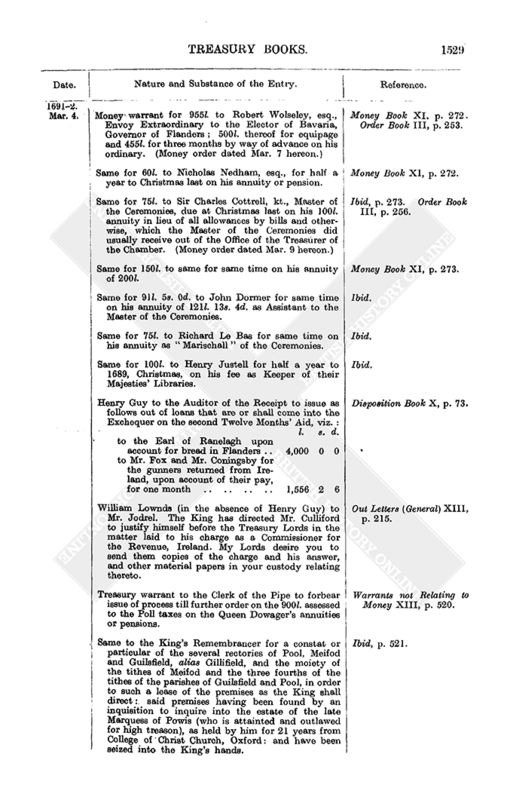 rent : with a grant of all the mesne profits payable to the Crown for the premises to be sued for and recovered by him : the consideration of the present grant to be a release which Chicheley is to make of all moneys due from the Crown to him as administrator to his brother, Sir Henry Chicheley, on any salary, pension or allowance payable to the said Sir Henry as Lieut. Governor of Virginia under Charles II. Appending : particular and memorandum, dated Feb. 27 last, by T. Eden, Deputy King's Remembrancer, of the premises. The lands lie between the Humber on the south and an old gulf called Old Creek or Channel on the north. This particular is made by an inquisition taken at the manor house of Edward Clarke, innholder, in Market Weighton, co. Yorks, 1690, Nov. 18, before Robert Hollis and Thomas Langley, esqrs., and John Fotherby, John Wilkinson and William Justice, gents, who found that the said lands have been derelict by the sea for 20 years past and during said time have been used and enjoyed as a common of pasture by the inhabitants of the said places, viz. 254 acres by those of South Cave, 554 acres by those of Broomfleet and 54 acres by those of Provost, and the issues and profits thereof have been taken by them for said 20 years : and that same do belong to the Crown and are of the clear yearly value of 70l. : and that the abovesaid Commissioners did thereupon seize same into the King's hands. Ibid, pp. 171-3. Royal sign manual for 150l. to Dame Arabella Macharty : as royal bounty : without account. (Money order dated Mar. 8 hereon.) Ibid, p. 176. Order Book III, p. 255. Royal sign manual for 200l. to Capt. John Richards : as royal bounty : in consideration of good services performed in Ireland. (Money order dated Mar. 8 hereon) King's Warrant Book XVI, p. 176. Order Book III, p. 253. Royal warrant to the Clerk of the Signet for a privy seal addressed to the Treasury, Exchequer and Admiralty and to all the Judges in England and the Colonies for full power and authority to be given to Thomas Offley to demand and receive on behalf of the King a true and particular account of any silver plate, bullion or other riches or goods taken up from several Spanish wrecks out of the sea [at Hispaniola] in America, whereof a tenth part has not been already answered to the Crown of England, viz. of what quantities etc., where found, how disposed of etc. : and also to demand the full tenth part thereof for the King, one moiety of which tenth part is hereby to be for the said Offley's own use, without account, as reward for his pains therein and the other moiety to be for the King : with power to Offley to give discharges, make compositions etc. : Offley to have the assistance of process etc. 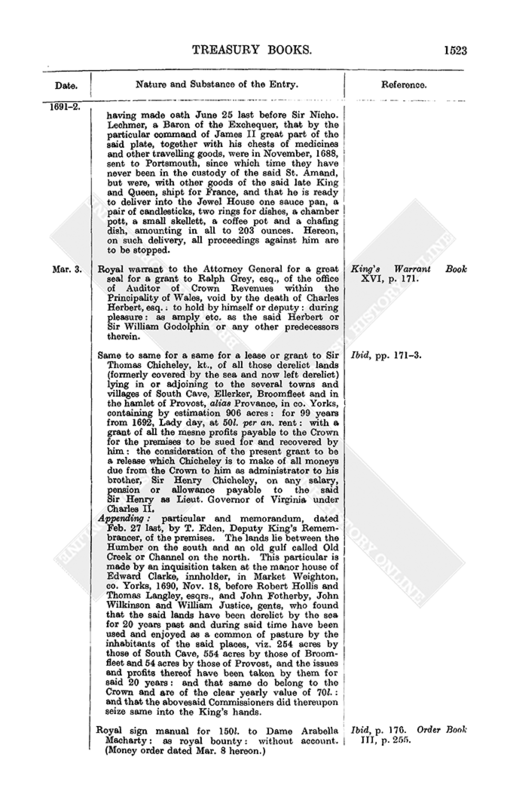 in the Courts of the Colonies and Plantations and of commissions to such persons as he shall nominate : he covenanting to keep a just and faithful account of all values recovered and received by him and to render such account to the Treasury Lords : all by reason that said Offley has represented to the King that some years since such riches as above were taken up out of the sea by several persons "of our Foreign Plantations" which they divided amongst themselves without any regard to the King's tenth part and have hitherto concealed the same, and further that there are several sums arisen of the said tenth part still remaining in the hands of several persons not yet accounted for. King's Warrant Book XVI, pp. 182-7. Same to the Attorney or Solicitor General for a great seal for a grant to Charles Bodvile. Earl of Radnor, of the office of Constable of the Castle of Carnarvon and the office of Chief Ranger of the Forest of Snowdon and Steward of the manors and possessions of the late monastery of Bardsey, co. Carnarvon : during pleasure. Ibid, p. 189. Henry Guy to the Auditor of the Receipt to issue out of the Exchequer "the following particulars towards satisfying of this week's disposition," viz. : Disposition Book X, pp. 71-3. Out of 32,415l. 3s. 7d. of loans on the second Twelve Months' Aid ; 913l. of the Double Excise ; 5,770l. of the 21d. per barrel and 2,084l. 5s. 4d. of moneys that shall first come in upon any of the aforegoing heads : making 41,182l. 8s. 11d. in all. Out of the Hereditary Excise and the Fourth of the Temporary Excise. Henry Guy [to the Principal Officers of the Ordnance] to pay the abovesaid two items (p. 1525) as follows : viz. : 2,000l. to Sir Joseph Herne upon account of arms bought at Maestricht ; 1,000l. to Monsieur Schuylenburg towards satisfying his bills, amounting to 11,183l. 1s. 0d. Disposition Book X, p. 73. Same to the Auditor of the Receipt to pay 4,410l. to Sir Francis Child for jewels, ut supra, p. 1519, out of such loans as shall be made by the said Sir Francis on credit of the East India Duties Act [2 Wm. and Mary, Sess. 2, c. 4]. Ibid, p. 74. Report to the Treasury Lords from William Blathwayt on the petition of Mr. Graham. 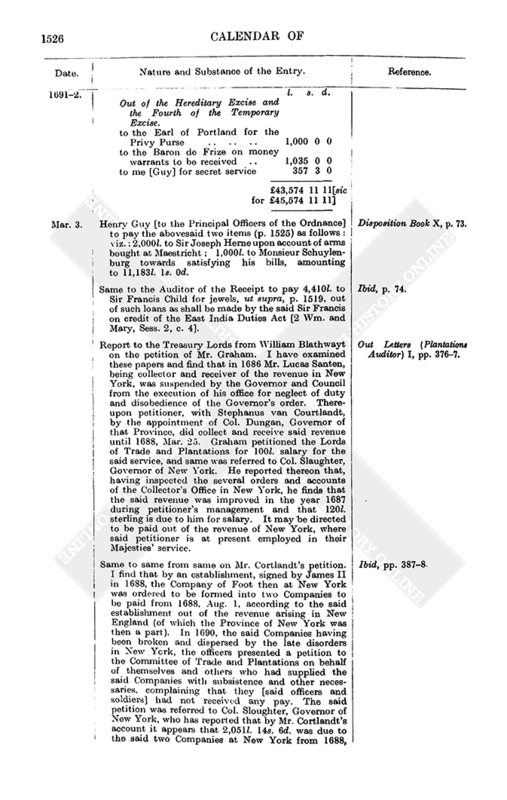 I have examined these papers and find that in 1686 Mr. Lucas Santen, being collector and receiver of the revenue in New York, was suspended by the Governor and Council from the execution of his office for neglect of duty and disobedience of the Governor's order. Thereupon petitioner, with Stephanus van Courtlandt, by the appointment of Col. Dungan, Governor of that Province, did collect and receive said revenue until 1688, Mar. 25. Graham petitioned the Lords of Trade and Plantations for 100l. salary for the said service, and same was referred to Col. Slaughter, Governor of New York. He reported thereon that, having inspected the several orders and accounts of the Collector's Office in New York, he finds that the said revenue was improved in the year 1687 during petitioner's management and that 120l. sterling is due to him for salary. It may be directed to be paid out of the revenue of New York, where said petitioner is at present employed in their Majesties' service. Out Letters (Plantations Auditor) I, pp. 376-7. Same to same from same on Mr. Cortlandt's petition. I find that by an establishment, signed by James II in 1688, the Company of Foot then at New York was ordered to be formed into two Companies to be paid from 1688, Aug. 1, according to the said establishment out of the revenue arising in New England (of which the Province of New York was then a part). In 1690, the said Companies having been broken and dispersed by the late disorders in New York, the officers presented a petition to the Committee of Trade and Plantations on behalf of themselves and others who had supplied the said Companies with subsistence and other necessaries, complaining that they [said officers and soldiers] had not received any pay. The said petition was referred to Col. Sloughter, Governor of New York, who has reported that by Mr. Cortlandt's account it appears that 2,051l. 14s. 6d. was due to the said two Companies at New York from 1688, Aug. 1, to 1689, June 18, when one of the said Companies was dispersed by the disorders there ; and to the other Company (which being at Albany continued in the service from the said 18th of June to 1689-90, Mar. 22) 457l. 1s. 0d., making together 2,508l. 15s. 0d. arrears due : of which sum Mr. Stephanus van Courtlandt has paid to them 1,405l. 5s. 9½d. for their subsistence and other necessary supplies of the two Companies in their several expeditions against the French and Indians for the security and defence of the country : so that there yet remains due to the officers and soldiers 1,103l. 9s. 8½d. Col. Sloughter also represents that Mr. Cortlandt has further disbursed 651l. 14s. 5¾d. for the public service at New York by order of the Government, thus making a total of 2,057l. 0s. 2¼d. paid by him, of which he has received 700l. 6s. 3d. out of the Public Treasury at New York, thus leaving 1,356l. 13s. 11¼d. This sum, together with the 1,103l. 9s. 8½d. 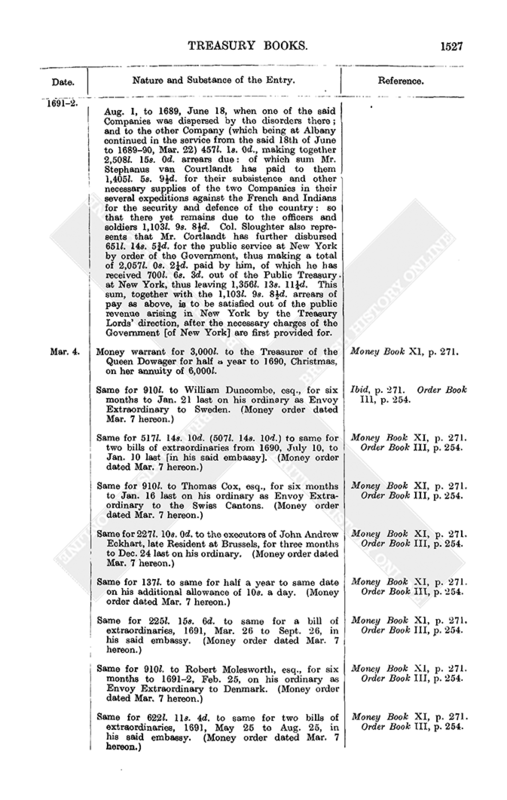 arrears of pay as above, is to be satisfied out of the public revenue arising in New York by the Treasury Lords' direction, after the necessary charges of the Government [of New York] are first provided for. Ibid, pp. 387-8. Money warrant for 3,000l. to the Treasurer of the Queen Dowager for half a year to 1690, Christmas, on her annuity of 6,000l. Money Book XI, p. 271. Same for 910l. to William Duncombe, esq., for six months to Jan. 21 last on his ordinary as Envoy Extraordinary to Sweden. (Money order dated Mar. 7 hereon.) Ibid, p. 271. Order Book III, p. 254. Same for 517l. 14s. 10d. (507l. 14s. 10d.) to same for two bills of extraordinaries from 1690, July 10, to Jan. 10 last [in his said embassy]. (Money order dated Mar. 7 hereon.) Money Book XI, p. 271. Order Book III, p. 254. Same for 910l. to Thomas Cox, esq., for six months to Jan. 16 last on his ordinary as Envoy Extraordinary to the Swiss Cantons. (Money order dated Mar. 7 hereon.) Money Book XI, p. 271. Order Book III, p. 254. Same for 227l. 10s. 0d. to the executors of John Andrew Eckhart, late Resident at Brussels, for three months to Dec. 24 last on his ordinary. (Money order dated Mar. 7 hereon.) Money Book XI, p. 271. Order Book III, p. 254. Same for 137l. to same for half a year to same date on his additional allowance of 10s. a day. (Money order dated Mar. 7 hereon.) Money Book XI, p. 271. Order Book III, p. 254. Same for 225l. 15s. 6d. to same for a bill of extraordinaries, 1691, Mar. 26 to Sept. 26, in his said embassy. (Money order dated Mar. 7 hereon.) Money Book XI, p. 271. Order Book III, p. 254. Same for 910l. to Robert Molesworth, esq., for six months to 1691-2, Feb. 25, on his ordinary as Envoy Extraordinary to Denmark. (Money order dated Mar. 7 hereon.) Money Book XI, p. 271. Order Book III, p. 254. Same for 622l. 11s. 4d. to same for two bills of extraordinaries, 1691, May 25 to Aug. 25, in his said embassy. (Money order dated Mar. 7 hereon.) Money Book XI, p. 271. Order Book III, p. 254. Money warrant for 910l. to James Johnson for six months to Jan. 22 last on his ordinary as Envoy Extraordinary to the Elector of Brandenburg. Money Book XI, p. 271. Same for 835l. 3s. 0d. to same on two bills of extraordinaries, 1690-1, Jan. 24, to 1691, July 24, in his said embassy. Ibid. Same for 273l. to Sir Paul Rycaut for three months to 1691, Dec. 26, on his ordinary as Resident with the Hanse Towns. (Money order dated Mar. 7 hereon.) Ibid, p. 271. Order Book III, p. 254. Same for 347l. 8s. 11d. to same for two bills of extraordinaries, 1691, July 1, to 1691-2, Jan. 1, in his said embassy. (Money order dated Mar. 7 hereon.) Money Book XI, p. 271. Order Book III, p. 254. Same for 455l. to William, Lord Paget, for three months to 1691, Dec. 4, on his ordinary as Envoy Extraordinary to the Emperor of Germany. (Money order dated Mar. 7 hereon.) Money Book XI, p. 272. Order Book III, p. 254. Same for 1,137l. 16s. 6d. to same for a bill of extraordinaries, 1690, Dec. 6, to 1691, Dec. 6, in his said embassy. (Money order dated Mar. 7 hereon.) Money Book XI, p. 272. Order Book III, p. 254. Same for 455l. to Charles, Visct. Dursley, for three months to Dec. 4 last on his ordinary of 5l. a day as Envoy Extraordinary to the States General. Money Book XI, p. 272. Same for 273l. to same for same time on his ordinary of 3l. a day as Plenipotentiary at the Congress at the Hague. Ibid. Same for 440l. 2s. 6d. to same for a bill of extraordinaries, 1691, June 5 to Dec. 5, in his said embassy. Ibid. Same for 455l. to Edmund Poley for three months to 1691-2, Jan. 28, on his ordinary as Envoy Extraordinary to the Duke of Savoy. (Money order dated Mar. 7 hereon.) Ibid, p. 272. Order Book III, p. 254. Same for 392l. 15s. 0d. to same for a bill of extraordinaries, 1691, July 1 to Dec. 1, in his said embassy. (Money order dated Mar. 7 hereon.) Money Book XI, p. 272. Order Book III, p. 254. Same for 300l. to Philibertus Herwart, esq., for six months to 1691-2, Feb. 2, on his allowance of 600l. per an. as Resident within the City and Republic of Geneva. (Money order dated Mar. 7 hereon.) Money Book XI, p. 272. Order Book III, p. 254. Same for 910l. to Alexander Stanhope, esq., for six months to 1691-2, Feb. 18, on his ordinary as Envoy Extraordinary to Spain. (Money order dated Mar. 7 hereon.) Money Book XI, p. 272. Order Book III, p. 256. Same for 910l. to Sir William Dutton Colt for six months to 1691-2, Feb. 24, on his ordinary as Envoy Extraordinary to the Princes of Brunswick and Luneburg. (Money order dated Mar. 7 hereon.) Money Book XI, p. 272. Order Book III, p. 254. Same for 70l. 7s. 5d. to Hugh Hughes, gent., Agent in Germany, for a bill of extraordinaries, 1690, Feb. 25, to 1691, Sept. 29, in their Majesties' service therein. (Money order dated Mar. 7 hereon.) Money Book XI, p. 272. Order Book III, p. 256. Money warrant for 955l. to Robert Wolseley, esq., Envoy Extraordinary to the Elector of Bavaria, Governor of Flanders ; 500l. thereof for equipage and 455l. for three months by way of advance on his ordinary. (Money order dated Mar. 7 hereon.) Money Book XI, p. 272. Order Book III, p. 253. Same for 60l. to Nicholas Nedham, esq., for half a year to Christmas last on his annuity or pension. Money Book XI, p. 272. Same for 75l. to Sir Charles Cottrell, kt., Master of the Ceremonies, due at Christmas last on his 100l. annuity in lieu of all allowances by bills and otherwise, which the Master of the Ceremonies did usually receive out of the Office of the Treasurer of the Chamber. (Money order dated Mar. 9 hereon.) Ibid, p. 273. Order Book III, p. 256. Same for 150l. to same for same time on his annuity of 200l. Money Book XI, p. 273. Same for 91l. 5s. 0d. to John Dormer for same time on his annuity of 121l. 13s. 4d. as Assistant to the Master of the Ceremonies. Ibid. Same for 75l. to Richard Le Bas for same time on his annuity as "Marischall" of the Ceremonies. Ibid. Same for 100l. to Henry Justell for half a year to 1689, Christmas, on his fee as Keeper of their Majesties' Libraries. Ibid. 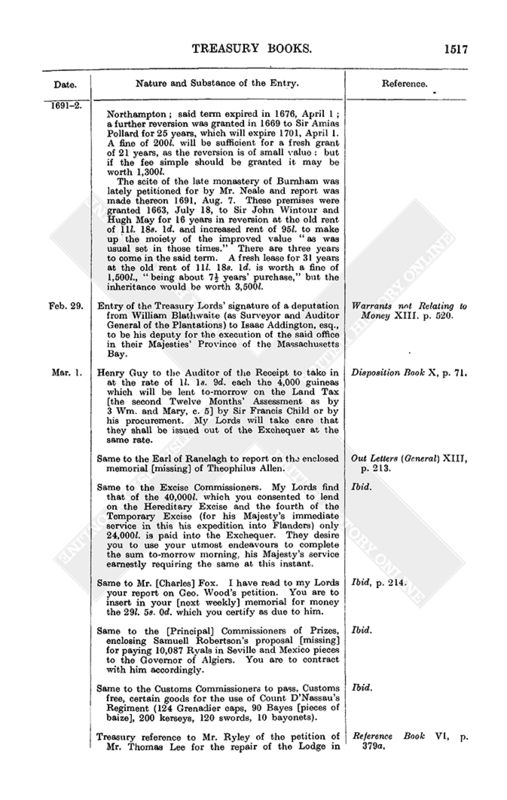 Henry Guy to the Auditor of the Receipt to issue as follows out of loans that are or shall come into the Exchequer on the second Twelve Months' Aid, viz. : Disposition Book X, p. 73. William Lownds (in the absence of Henry Guy) to Mr. Jodrel. 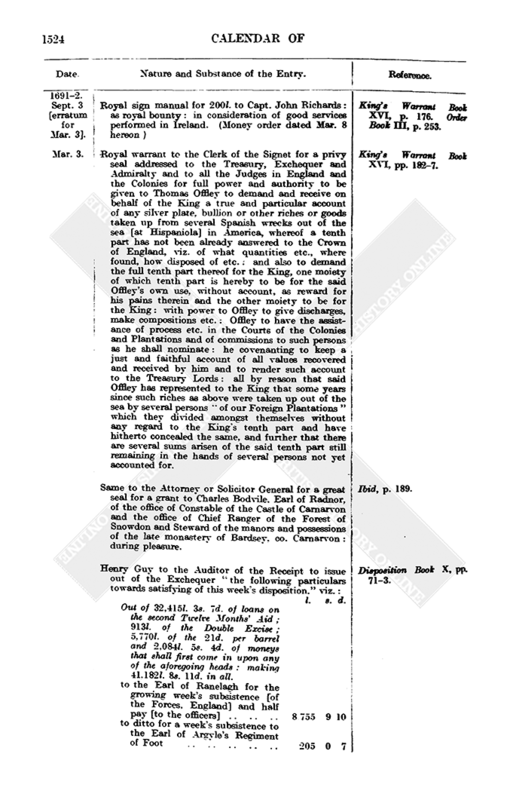 The King has directed Mr. Culliford to justify himself before the Treasury Lords in the matter laid to his charge as a Commissioner for the Revenue, Ireland. My Lords desire you to send them copies of the charge and his answer, and other material papers in your custody relating thereto. Out Letters (General) XIII, p. 215. Treasury warrant to the Clerk of the Pipe to forbear issue of process till further order on the 900l. assessed to the Poll taxes on the Queen Dowager's annuities or pensions. Warrants not Relating to Money XIII, p. 520. Same to the King's Remembrancer for a constat or particular of the several rectories of Pool, Meifod and Guilsfield, alias Gillifield, and the moiety of the tithes of Meifod and the three fourths of the tithes of the parishes of Guilsfield and Pool, in order to such a lease of the premises as the King shall direct : said premises having been found by an inquisition to inquire into the estate of the late Marquess of Powis (who is attainted and outlawed for high treason), as held by him for 21 years from College of Christ Church, Oxford : and have been seized into the King's hands. Ibid, p. 521. Treasury warrant to the Auditor of Crown Lands for a particular and ratal of the manor of Kirton in Lindsey, co. Lincoln, parcel of the Duchy of Cornwall, in order to an extension of lease thereof to Rawson Hart, esq. Prefixing : report, dated Jan. 18 last, by William Tailer, Deputy Surveyor General of Crown Lands, on said Hart's petition for same. Petitioner's father, Major Hart, corresponded with the late Duke of Albemarle in the Restoration of Charles II, having purchased the scite and part of the demesnes of said manor under the then late [Usurped] Powers, together with a piece of ground called Magellmore, and two other parcels of land there called South Green and Fieldmere, all belonging to said Duchy. He had a lease thereof 1662, July 8, for 31 years, and a further term therein 1677, June 16, for 14 years, at the several old rents of 15l. for the scite, demesnes and Magellmore and 6s. for Southgreen and Fieldmere. For a 16 years' extension of the 15 years in being I advise a fine of 200l., as the premises have been valued at 80l. per an. Warrants not Relating to Money XIII, pp. 522-3. Money warrant for 3,375l. to the Commissioners of the Great Seal (Sir John Trevor, Sir William Rawlinson and Sir Geo. Hutchins, kts.) for three quarters to Christmas last on their allowances of 1,500l. per an. each. (Money order dated Mar. 8 hereon.) Money Book XI, p. 273. Order Book III, p. 252.